MDS-5000C/5000CN scans up to A3 size paper. It works standalone or with PC. It has the wide touch screen of 10 inch and Windows 10 is installed. 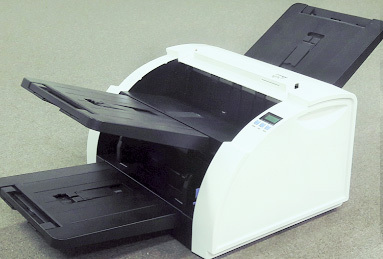 MDS-5000C/5000CN has a deep hopper (500 papers) and 2 pockets. 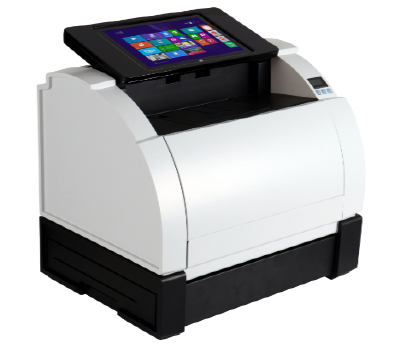 MDS-5000C/5000CN can scan from A6 size to A3 size papers at fast scan speed. MDS-5000C/5000CN has both the front and rear side pockets. The papers scanned can be sorted into the 2 pockets. The depth of each pocket is 50 mm. It stores about 500 papers. MDS-5000C/5000CN is designed robust and strong against trouble and stop. You will need less technical care. From the 10 inch touch display of MDS-5000CN, a client can scan his documents without connected to PC. He can move the scanned images to his cloud or email in the touch display. MDS-5000CN can also work connected to PC. The consumable rollers can be exchanged at customer's side without difficulty. MDS-5000C/5000CN has the long paper scan function. It can scan up to 800 mm in A4 (or letter) size paper. Endorser (printed post scanning) can print time, name and the others on the front and/or back side of each document in long characters. Imprinter can stamp company logo or sophisticated characters. MICR Reader can read both E-13B font, and CMC-7 font, and stores the txt file into C drive automatically. UV/IR sensor can be added to detect fake document. OCR/OMR/DMR/Barcode reading is possible by application software. Copyright © 2017 Zoo Moon Trading Co. All rights reserved.